Sunshine Coast Accommodation - Once you have reached the Town of Gibsons, where do you stay? Sunshine Coast Accommodations can be somewhat limited depending on the region you are in. Everyone has their preferences for accomodations, some love hotels, motels, or quaint B&B's. There are no major hotel or motel chains in Gibsons. Your choices are bed and breakfasts, cottage rentals, vacation rentals, campgrounds, and private motels. For a listing of available commercial hotels and motels in Gibsons, see the accomodations listing in the Gibsons Service Directory. There is still something available in everyones price range, style and comfort level. Just a little more creative searching is required. Hopefully you will find the references below useful in your search for Gibsons Accomodations. There are many fully contained cottages to rent, usually for the week.Prices and quality of the cottages vary greatly. Check out their sites in detail. Links to some cottages are in the link the the Sunshine Coast B&B Association below. For executive accomodation, there are a few options. One of the nicest is Skyline Executive Accomodations. There are 3 units available to rent by the week and two of the units are available on a daily basis. 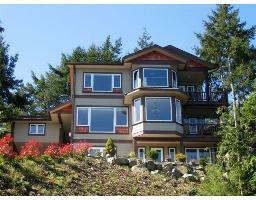 The views are to die for from this home overlooking the town of Gibsons and the harbour. It is luxury in a westcoast style. You will not be dissappointed. The main unit is over 1500 square feet of luxury on two levels (the upper two levels in the photo to the right). Granite and wood flooring, gas fireplace in the living room, luxury ensuite, and a fully equipped kitchen with gas range and BBQ. This unit is available by the week only, and is $1900 during peak season, May - September and $1500 October through April. Complete the form below to reserve your stay and receive a 5% discount! There is also the Sunshine Coast B&B Association, and their web page is Sunshine Coast Bed & Breakfast Cottage Owners Association. There is a huge number of Gibsons Accomodations available on this site. Campgrounds in Gibsons are another story. There is only Langdale Campground which has a few sites. Even though there is only 1 campground, there is a Provincial Campsite just a short drive away (10 minutes) in beautiful Roberts Creek BC. Enjoy your stay in beautiful Gibsons Landing!